The Messerschmitt Bf109 is one of the most famous fighters in history. 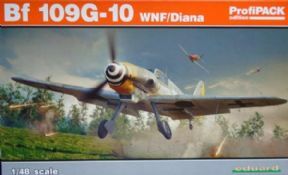 More Bf109's (over 33000) were built than any other fighter and it shot down many more opponents than any other fighter in history.The Bf109G was similar to the F but it introduced the DB605 inverted V-12 engine, which was more powerful than the earlier DB601, with more development potential. The main early versions were the G-2 and G-4, which had a 20mm cannon and two 7.92mm machine guns in the nose. The G-5 and G-6 had the machine guns replaced by 13mm heavy machine guns, which needed bulges on top of the cowling to accomodate the larger breech blocks. The G-5 and G-6 were essentially the same, the only difference being the G-5 had a pressurised cockpit for high altitude operations. The G-6 was the most common version of the G series of 109's and could be fitted with a varitey of external ordnance. On the centreline it could carry a bomb or drop tank and it was fairly common to see them with 20mm cannon pods or 21cm granaten werfers under each wing. This gave them heavier firepower for shooting down bombers at the expense of top speed and some agility. Despite being generally outclassed by Allied fighters, such as the Mustang, Tempest and Griffon Spitfires, the G-6 was in service until the end of the war and could still be a dangerous opponent when flown by an experienced pilot. The G-14 was an attempt to rationalise and simplify the G-6 to maximise production, however in practice there were as many variations as the G-6! Following on from the G-6/G-14 was the G-10. These were new G-14 airframes combined with the DB605D-2 boosted engine, which gave greater performance to the G series airframe prior to the all new K series Bf109's. The G-10 had a revised bulged engine cowling and the later style 'erla' canopy. 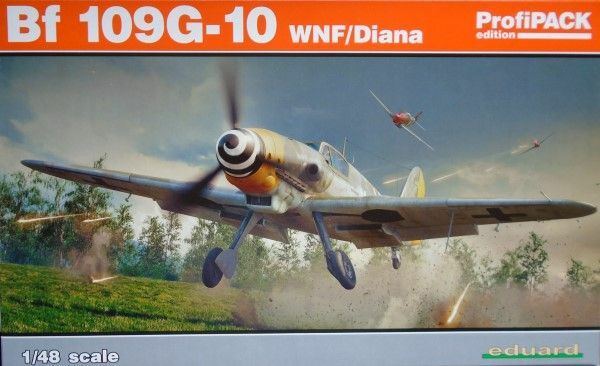 Please note that this is Eduard's new tool kit of the Bf109G-10 and contains Colour Zoom etch metal parts, Canopy/wheel mask, 4 different marking options, as well as the plastic parts.